Emigration is the act of leaving one's country to live somewhere else. 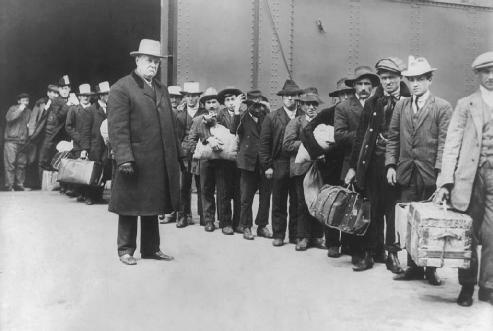 These men emigrated from Italy to the United States in 1911. The act of moving from one country to another with intention not to return. It is to be distinguished from expatriation, which means the Abandonment of one's country and renunciation of one's citizenship in it, while emigration denotes merely the removal of person and property to another country. Expatriation is usually the consequence of emigration. Emigration is also sometimes used in reference to the removal from one section to another of the same country. EMIGRATION. The act of removing from one place to another. It is sometimes used in the same sense as expatriation, (q.v.) but there is some difference in the signification. Expatriation is the act of abandoning one's country, while emigration is, perhaps not strictly, applied to the act of removing from one part of the country to another. Vide 2 Kent, Com. 36. If Take It, Take It and As Above, So Below, 2008, another delicious bird-and-fruit pairing, belong to Orr's established method, Internal Emmigration, 2008, is of the newer school. Early content will include the history of sport and an account of immigration and emmigration in Welsh history. Industrialization and the growth of urban centres resulted in a mass rural emmigration. Allotment gardens: past, present & future?